This is the second time out the gate for the Sony Xperia Tablet S. It originally launched in September, but was quickly pulled from the shelves thanks to a manufacturing fault. That's unfortunate for Sony, because in the interim the Google Nexus 10, Amazon Kindle Fire HD, iPad 4 and iPad mini have all hit the market. That gives this refresh of the Sony Tablet S some rather stiff competition. But with a premium build and specs to match, it's certainly still got a chance. A striking folded book design ensures that the Sony Xperia Tablet S is eye catching, easily standing out from the hordes of identikit Android tablets. On top of that it's got a premium finish that brings to mind the build of an iPad more than most other tablets. The end result is that it looks stylish and expensive. That sense of it being a premium device isn't just skin deep either. With a 1.3GHz quad-core Tegra 3 processor it should be pretty powerful too. Though it only has 1GB of RAM, and the 1280 x 800, 9.4-inch display isn't anything to write home about in resolution terms, coming in at just 161 pixels per inch. That's a little disappointing, given that the similarly positioned Google Nexus 10 has 2GB of RAM and a 2560 x 1600, 300 ppi display. Running Android 4.0.3 Ice Cream Sandwich, the Sony Xperia Tablet S isn't as up to date as it could be, but at least it's getting an update to the latest major version of Android. The Sony Xperia Tablet S comes in 16GB, 32GB and 64GB varieties, with the option of Wi-Fi only or Wi-Fi and 3G (3G version only currently available in the UK, 64GB version not available in Australia). The price starts at £329/AU$539/US$399.99 for the 16GB Wi-Fi-only version of the tablet, which puts it roughly in line with the equivalent Google Nexus 10 and significantly cheaper than a 16GB iPad 4. Prices rise to £379/AU$649/US$499.99 for a 32GB model, which is still a bit cheaper than a 16GB iPad 4, or £449/US599.99 for a 64GB version. If you're in the UK and want the 3G version, it currently only seems to be available in 16GB and will set you back £429 (around AU$656/US$691), which again is about £70 cheaper than the equivalent iPad 4. With only 1GB of RAM, the Sony Xperia Tablet S doesn't stand up too well to the 2GB of RAM on what's likely to be one of its biggest rivals - the Google Nexus 10. But it's not too much of a problem, since 1GB is still the norm, with both the iPad 4 and the Asus Transformer Pad Infinity sporting 1GB of RAM. Running Android 4.0.3 Ice Cream Sandwich, its operating system feels slightly dated too, though again many other tablets are in the same boat. Its 1.3GHz quad-core Tegra 3 processor is more competitive at least, since many tablets still rock dual-core processors. Bluetooth 3.0 and USB 2.0 support are par for the course, but support for SD cards of up to 32GB gives the Sony Xperia Tablet S a selling point over an iPad or Nexus tablet, since neither of those have any expandable storage. Interestingly it takes SD cards rather than micro SD cards. We're not sure why that is, particularly since it still only supports cards of up to 32GB, but it's worth noting. The Sony Xperia Tablet S is powered by a 6,000mAh battery, which doesn't sound like much - the Google Nexus 10 rocks a 9,000mAh battery and the iPad 4 comes with an enormous 11,666mAh battery. Despite the relatively small size, Sony reckons that it should last a pretty reasonable 12 hours with 'standard usage'. 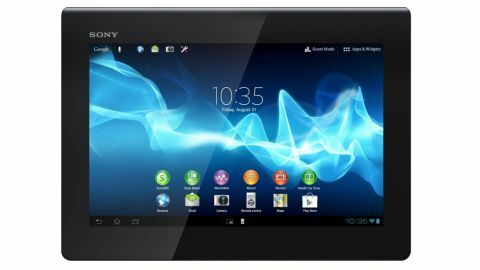 The Sony Xperia Tablet S is undoubtedly a premium device. With a shiny aluminium body and an iconic fold at the top, it really is a looker. Viewed front-on it doesn't do quite as much to stand out, because it's basically just a black rectangle. But the start of the curve is still just visible at the top, making it at least a little different from the norm, while the slightly rounded corners ensure it doesn't look unattractive. The front is also totally devoid of buttons, a sight that has started to become commonplace on Android tablets but was definitely the right way to go. The only things you will find on the front are a black bezel around the edge of the screen, giving you somewhere to put your fingers without obscuring anything, along with a small 'Sony' logo at the top-left and a camera lens in the centre of the top edge, capable of taking 1 megapixel photos and shooting videos in 720p. The 9.4-inch LCD screen is only 1280 x 800, giving it a relatively low pixel density of 161 PPI. It's certainly not the best screen you'll ever come across. Numbers aside, the resolution is noticeably worse than even the Google Nexus 7, let alone the iPad 4 or Google Nexus 10, while its brightness and contrast isn't desperately impressive either. It does at least provide good viewing angles, staying visible from pretty much any position. While the screen never gets all that bright, there is also a useful auto-brightness option, which will dim or brighten the screen automatically based on how bright your surroundings are. The back sports that stylish black fold at the top while the rest of it is shiny aluminium. The main 8 megapixel, 1080p camera can be found in the centre of the fold, otherwise the only real feature is a pair of small speakers running along the bottom left and bottom right of the back. The bottom edge of the Sony Xperia Tablet S houses a 'multi-port' that the charger and included USB cable connect to. There isn't a dedicated HDMI port, but you can purchase an adaptor that enables you to connect the multi-port via HDMI. There's a removable cover for the port, and while the cover is on, the Sony Xperia Tablet S is supposedly splash proof, though of course you'd still do well to keep it away from any significant amount of liquid. The right edge holds the tablet's only two buttons - a power button at the top (which is also used to sleep and wake the tablet) and a volume rocker just below it. They stick out enough to be easy to press but the curved sides mean that they aren't prominent enough to spoil the lines. The left edge has a 3.5mm headphone port at the top and a covered SD card slot slightly further down. The top edge curves off into the fold on the back, with no ports or buttons to spoil it. The tablet generally feels good in the hand. Weighing 570g, it's slightly lighter than some of its rivals (the Google Nexus 10 is 603g while the iPad 4 weighs 652g) and the difference is noticeable. It makes it light enough to hold comfortably for longer, while still being weighty enough to not feel cheap. The folded edge on the back does make it ever so slightly top-heavy and unbalanced when held in landscape mode, and as such it's advisable to hold it with the fold at the bottom - even though that appears to be upside-down. On the other hand, the fold has a mottled feel to it that both makes it pleasant to hold and leaves it feeling secure in your hand. Along with the curved edges and relatively light weight of the tablet, this makes it a great device to use for long periods without a stand. Whether you're watching movies, playing games or web browsing, it provides a pleasant, comfortable experience. With dimensions of 239.8 x 174.4 x 8.8mm (9.44 x 6.87 x 0.35 inches) the Sony Xperia Tablet S is not the sleekest tablet you'll ever see, though folded back aside it is quite slim and definitely doesn't look or feel overly large. It certainly ticks a lot of boxes, with a premium build, expandable storage (along with up to 64GB onboard), a fast processor and a 3G version available. On the other hand, the screen is a bit of a disappointment and Android 4.0.3 Ice Cream Sandwich is two iterations behind, but for the £329/AU$539/US$399.99 price tag it has still got a lot going for it.